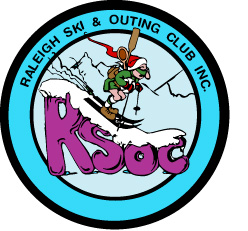 Home - Raleigh Ski and Outing Club, Inc.
Raleigh Ski and Outing Club, Inc.
Over 50 Years of Fun and Adventure! RSOC is a not-for-profit organization staffed entirely by volunteers who are working to promote skiing, camping, hiking, sailing, canoeing, rafting and other outdoor activities. RSOC promotes the conservation of our natural resources. who served the RSOC in that position for the past ten years! John has been dedicated in attending and coordinating all Crescent Ski Council Race Team events on behalf of the RSOC Ski Race Team. He continually recruited new racers and took time out of his busy schedule to travel to attend CSC planning meetings and conventions. During John’s tenure as Ski Race Team Director, the RSOC Race Team has maintained one of the highest rankings among all other CSC race teams. We want John to know how much we appreciate his effort and dedication as Ski Race Team Director which has contributed to a very strong RSOC Race Team of which we are very proud! Thank you, John! Also, long-time Publicity Director, Andy Saliby, is stepping down from his post on the RSOC Board of Directors. Andy’s presence on the Board will be greatly missed through him promoting the RSOC by maintaining the RSOC Meetup website and distributing information about our club throughout the Triangle. We thank Andy so much for his contributions to keep the RSOC a vital organization!